Even people who are not golf fans know who Phil Mickelson is because of all the ads he appears in. Here is a list of the companies that sponsor Phil Mickelson in 2019. Phil Mickelson is one of the most successful golfers in the history of the game. Mickelson has won 43 times on the PGA Tour which is the 9th most in history. He has also won five golf majors and finished 2nd in majors another 10 times including six seconds at the U.S. Open, the one major he has yet to win. Mickelson has parlayed all that success on the golf course into a ton of very lucrative endorsement deals as outlined below. On a yearly basis Phil Mickelson earns at least $40 million a year from the endorsements he has with the sponsors below. The latest company to sponsor Phil Mickelson is dress shirt maker Mizzen+Main. Reportedly, Mickelson is getting a piece of the company as part of his sponsorship to wear the companies dress shirts while playing in tournaments. In 2010, Phil Mickelson was diagnosed with psoriatic arthritis which causes pain and swelling in the joints. Mickelson started taking the drug Enbrel to deal with the problem. 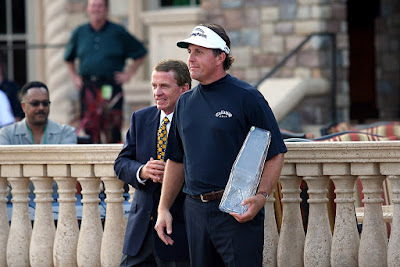 Amgen makes the drug and they started sponsoring Phil Mickelson in 2011. This has to be a very lucrative sponsorship deal for Mickelson. Phil Mickelson originally signed with Callaway in 2004 to use their clubs (he was using Titleist clubs before 2004). In 2017, Callaway re-signed Phil Mickelson to an endorsement deal that will last for the rest of Phil's career. Workday is a cloud based on-demand financial management and human resources software vendor. It's a publicly traded company with the stock ticker of WDAY. Workday signed Phil Mickelson to be a brand ambassador in 2017 and you can see their logo on Phil's golf shirts at tournaments. The accounting firm KPMG has been a longtime sponsor of Phil Mickelson. You can see the KPMG logo on the hats or caps Phil wears during tournaments. Phil Mickelson became a Playing Editor at Golf Digest in 1993 and he has written exclusive golf instruction articles for the magazine since 2003. Phil Mickelson partners with the PGA Tour on behalf of various military support groups like Birdies for the Brave, Homes For Our Troops and Special Operations Warrior Foundation. In 2016, Phil Mickelson became a PGA Tour ambassador for the Greenbrier Resort and you have probably see his ads on TV saying how much he and his family love the place. Mickelson has a company called Phil Mickelson Design which builds golf courses and the Greenbrier hired Mickelson's company to redesign their course after it suffered severe damage from flooding in 2017. The Grayhawk Golf Club located in Scottsdale, Arizona has had Phil Mickelson as a PGA Tour ambassador since the place opened in 1995. If you visit you can eat at Phil's Grill. Phil Mickelson's good friend Skip McGee left Barclays Plc in 2014 and started Intrepid Financial Services in 2015. Phil Mickelson was sponsored by Barclays for nine years (he used to wear the Barclays logo on his shirts) but that partnership ended and Mickelson signed with Intrepid Financial Service in early 2017. Phil Mickelson wears a very expensive Rolex watch because the luxury watch maker pays him a pretty penny to do so. Rolex loves when one of their sponsored golfers wins a tournament because the watch they are wearing is clearly on display when they hold up the winners trophy for all the photographers.